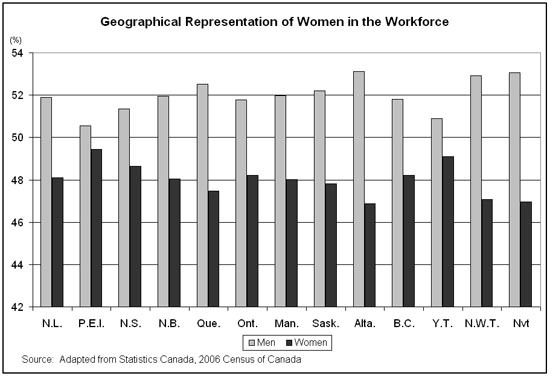 In 2006, women represented less than 50% of the working population in every province across Canada, despite the fact that they may have been equally if not more educated then most of these men. With economic crisis in 2008, for the first time ever, more women than men were in the paid work force. Things have evolved tremendously in the last century, however, women still strive for equality, especially in the work place. Women are participating more in the paid work force as opposed to contributing all their time and effort in the unpaid domain, like cleaning and being care givers. The graph below shows that the gender income gap is slowly starting to decrease, but it also shows that since the late 1990s the wage gap is greater for those women who have completed a university degree. 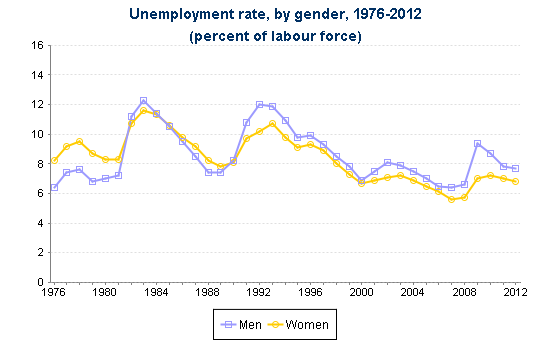 In 2012, women faced an official unemployment rate of 6.8%, whereas men faced for 7.7%. 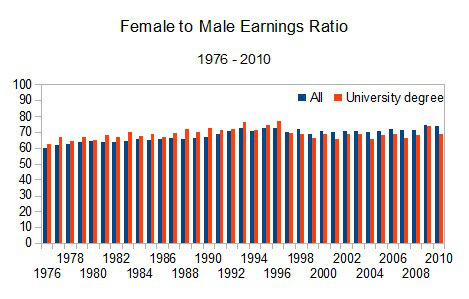 Source As the graph shows, this pattern of lower rates for women has held for the last 25 years. Equally clearly, during periods of economic difficulties many more men lose jobs than do women. There are several ways to eliminate discrimination in the work force. The most significant way to eliminate this is to mandate equality. If it was mandated that men and women should be treated equally and paid equally for the work that they are doing, discrimination would decrease and slowly become extinct. Attitudes towards this change would gradually change, and women would finally be given the chance to prove their worth in the labour market and although we are a long way away from gender equality in the work place, we are gradually taking steps in the right direction.